What if we told you that you could have all the hair and skin you would ever need using only one ingredient at a time - without visiting the cosmetics counter or drugstore? Look no further than your own kitchen, because Mother Nature's got you covered - and in some cases, she offers better results than your average beauty counter brand, for a fraction of the cost! What have you got to lose? Get your DIY groove on with these awesome natural standalone ingredients! The golden stuff is practically a holy grail in skincare. It not only naturally moisturizing, it is also naturally antioxidant and antimicrobial, yet non-irritant and anti-inflammatory! Honey can be used to cleanse the skin (apply and rinse with warm water), or as a facial masque (apply thin layer, leave on 15-20 minutes, rinse gently) or as a soothing bath soak - just add two heaping tablespoons to a warm bath and relax into the heavenly scent. Tip: go for raw honey for maximum benefits on all counts. If you don’t want to use makeup remover or baby oil, then olive oil works. It also contains antioxidants such as vitamins A and E. Aside from helping you moisturize your skin, it helps “feed” your skin a lot of nutrients and biotin extracts. We love organic olive oil on our legs in summer, for a soft glow that is all-natural. Olive oil also makes a great hair mask to help keep your hair soft, strong and resilient - just apply warm, let sit for a few minutes, and wash as usual. Lemons are antibactieral and can help treat skin blemishes - just apply lemon juice directly to blackheds. It's also a gentle skin brightener due to its citric acid and Vitamin C. Remember to use sunscreen if you are treating your skin with lemon, since the citrus can make you more sensitive to UV rays. Use lemon internally too - a glass of warm water with lemon every morning will help keep you hydrated and add vitamins, antioxidants ans zesty flavour to your day. With vitamins A, C, and E all in its green goodness, avocado is excellent for dry skin and damaged hair. Its beautiful pasty green color is actually because of the nutritional benefits it offers—niacin, panthothenic acid, potassium, iron, and plenty of natural fats and emollients. Set it into your hair for about an hour before washing, and you’ve given yourself the best natural moisture-boosting treatment your hair could ever ask for. You have to mash a banana up to make sure you get every bit of its healthiness into your skin, but it’s completely worth it. Complete with vitamins A, B, and E, potassium, magnesium, iodine, zinc, folic acid, and iron, bananas have it all if you’re looking to smear a fruit onto your face. 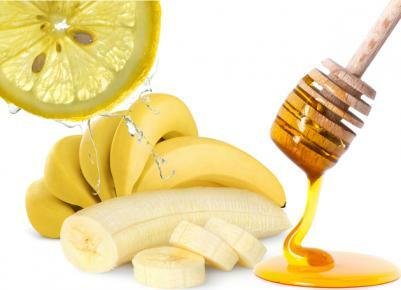 A banana face mask can help moisturize and heal your skin, and it smells yummy going on, too.